Extremely sturdy branches: We find this best for hanging ornaments, it will also help your tree maintain its' classic "pyramid" shape. Shorter, softer needles: This means longer retention as it is harder for children and pets to pull them out. All tree varieties generally have the same needle retention period, so the ultimate factors in keeping the needles from falling out are freshness and care. Fragrance: Although not as strong as the Balsam- the unique scent of the Fraser Fir tends to last the longest, giving you that fresh tree smell well into January. Variety: Fraser's come in a great range of width from skinny to extra-wide and are cut at all heights over four feet tall. In 2011 we began a relationship with a Farm in Canada to exclusively receive Fraser Firs. Fraser's, famed for coming from North Carolina, are also grown in varieties in Canada. We tend to favor these varieties for their blue tones and freshness that comes with the cooler winters. 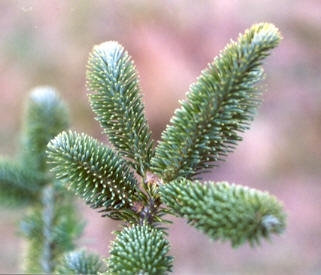 A small portion of our trees are a new variety of Fraser Firs named Cook Fir. These trees retain all of our favorite qualities of the Fraser while sharing some attributes with a Balsam. This variety is able to grow quicker than a Fraser allowing our farms the assurance of supply quality trees year after year. The only visible difference tends to be a slightly longer needle. All of our Frasers are cut one week before we receive them from a farm in the south-eastern region of Quebec. Thanks to our partnership with a smaller farm we recieve priority on the last trees to be cut from the fields, while larger farms tend to cut trees months in advance. Our farms have transitioned into only providing the highest quality firs. The premium rating is used by tree farmers to designate only the best trees that dot fields of Fraser Firs. This quality of fir always has a perfect pyramid shape. Premium Frasers tend to have a higher branch count making them "fuller" trees on average. We only sell Frasers that are 5ft in height or taller; for smaller, less expensive trees, see the "We also sell" section below. Please note the $12 per foot pricing is an average, trees are sold at prices rounded to the nearest $5. For exact pricing please view our Order Online page. Trees over 8ft in height are subject to individual price rates due to their limited availability on a yearly basis. For those looking for a smaller tree. These discount trees can vary in quality from first through field run and are reccomended to customers with very little space or a limited price range. These cute balsams make for a great decoration, reminiscent of Charlie Brown's famed fir. They do not require a stand and are instead mounted in a wood disk from a large tree. Unfortunately they do not last very long as they cannot be watered. Our small Christmas tree stands will support most trees up to 5ft feet tall depending on trunk circumference. However, we recommend purchasing a large stand that will support all trees up to 8ft tall for years to come. We offer a high quality pine needle roping, otherwise known as garland, in a medium thickness. It is sold by the foot with a 10 ft. minimum. Garland is great for decorating borders, railings and doorways. Our wreathes are hand made from branches of Canadian Balsams. They come in 12" and 16" diameters both natural and decorated by Foley Firs. Custom decorated wreaths can be made at the stand by request. As the holiday season progresses we accumulate a large number of unloved bottom branches from trees that have been sold. These free Fraser boughs can be of many uses in your holiday decorations. Philadelphia based artist and craftsman Alex Holland studied glass extensively during his undergraduate training at The University of the Arts. He will be selling a variety of styles of Christmas Ornaments as well as other handcrafted holiday decorations each weekend at our stand. These ornaments are also available online with any tree purchase in four various styles.